Unreserved - 1998 Case CX100 Tractor; 1976 White 1370 MFWD Tractor; 2014 Ford F-150 Super Crew FX4 Off Road; 2002 Dodge Ram 2500 SLT; 2015 Polaris Indy Voyageur Snowmobile; Polaris Ranger XP800 EFI Side-by-Side; Lund SV-14 Boat w/ 15HP Honda Motor & Trailer; 2012 New Man's Sled Bed Trailer; 2008 Lone Star Goose Neck Trailer. Other: Snow Blower, Attachments, JD Zero Turn Mower, Acreage Farm Equip, Garden, Yard & Shop Equip., Welder, Gun Cabinet. Household: Samsung 65" Smart TV; Leather Home Theater Seats & Theatre Sound System, Complete Household Furnishings & Personal Effects, Natural Gas Weber Genesis BBQ, Lawn & Patio Furniture & Much More! 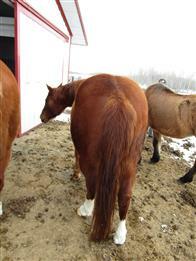 In addition, the Wasylyshen's will be looking for a new home for their 3 beautiful horses. Take advantage of this impressive acreage sale, just in time for spring!